Award-winning web site that provides a large quantity of product documentation to customers. See Information Architecture Project for the design and project management part of the effort. Foglight eDocs was built with standard, freely available web technologies and does not require a database or content management system. Navigation pages group the content by product and release. Landing pages present the available content using jQuery UI accordion components. 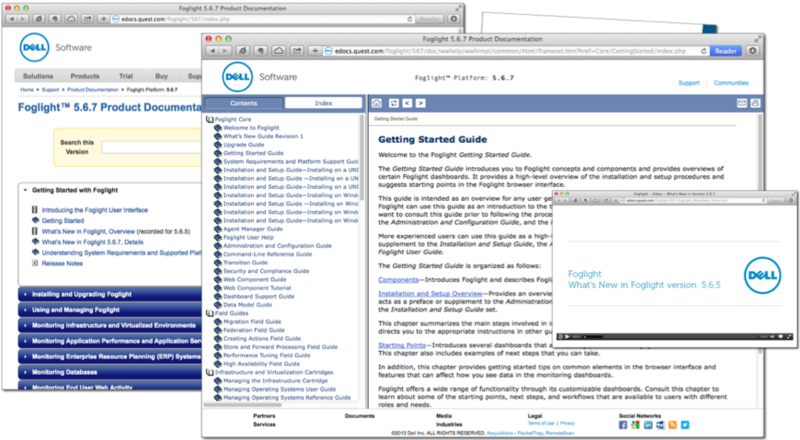 Navigation and landing pages are built and updated manually, with the user guides generated using a tool called WebWorks ePublisher. I built tools and scripting to automate as much of the regeneration and updating of the site content as possible.